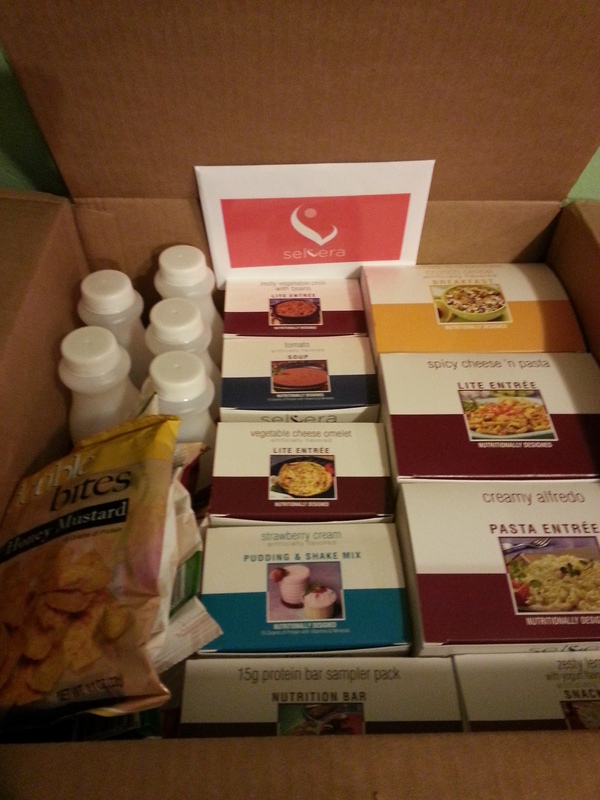 I just got my 2nd Selvera box of food for the next 2 weeks. Lots of shakes in this one – YAY!! The shakes are really tasty and filling, so that’s good. I didn’t do so well over the weekend, I’ll admit. Weekends are so tricky and even trickier when my husband is around a lot. Usually he is away for most of the weekend days either working or enjoying his hobbies, so I get used to doing my own thing. Having him around is great – we enjoy doing things together, but I tend to adjust my eating habits when he’s around because we are usually running errands or tackling a project together. I was also still in a bit of a funk over the weekend and did a lot more nibbling than I would have liked. Nothing horrible or binge-like, but I grazed a bit more than usual. By Sunday evening I was over myself and straightened up my at and returned to acting like someone who is interested in losing fat instead of someone who is interested in wallowing in Cheetos and sadness. These last 3 days (Mon-Wed) have been very good. I’ll admit that by Tuesday I was ready for my 2nd Selvera meal box to arrive and having that to look forward to was a big help in not face-planting into a casserole. My box was waiting for me when I got home from work Tuesday evening so I waited until yesterday to start in on the Week 3 foods. In this box, I got some cream of tomato soup – very yummy and comforting in a way that only hot soup can be. I also received lots of shakes and my favorite lemon bars, along with more protein bars. As far as entrees, there is pasta alfredo, spicy cheese and macaroni, vegetable chili, and something else I can’t remember. Also have lots of snack-chip-type things for those times when you need a salty crunch (which lately I seem to need a lot). I have been walking intervals on the treadmill and doing strength training exercises with dumbbells on alternating days this week. This weekend is Kyra’s Virtual 5k challenge so I’ll be doing that as well, probably on Saturday. My body just feels so much better when I’m exercising regularly. Duh. What am I learning from all of this? I’m learning that I need a lot less food to be satisfied than I originally thought. I sometimes get a little nervous at the small portion sizes, but I’ve never walked away from a Selvera meal thinking that I need more. And don’t forget that I’m adding fruits and vegetables to these meals, which adds bulk but not a lot of calories, so between the high protein meals, and the fiber filled fruits & veggies, I’m feeling pretty satisfied. I still sometimes want something sweet to eat after a meal, but I find that a swig of vanilla soy milk satisfies that desire pretty well. I typically just want a taste of sweet after a meal, not necessarily a large dessert, so the vanilla soy milk is just right. Ooo YAY! The loss is right on target! You’re doing great! YAY for Jill! Do you mean something different by “entrée” than I do? In Australia it’s a small portion of something that you have before a main meal, a taster to get the juices flowing, like an entrée of garlic prawns in a restaurant before you have your big steak and veges. (And you’d probably only have an entree at home if you were hosting a fancy dinner party.) The things you are listing for “entrée” don’t sound like that, I’m assuming they are your main meal? ?